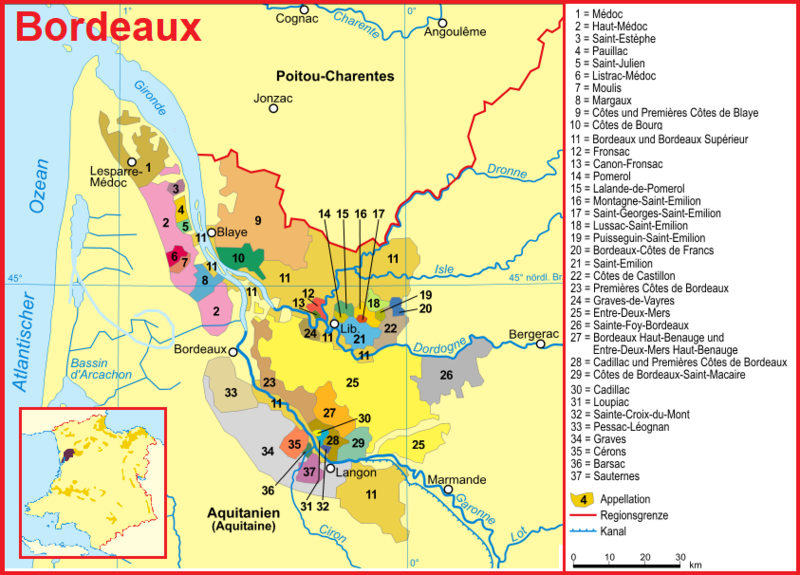 The area in the south of the region Bordeaux was declared in 1980 under the name Cadillac as an appellation. It is named after the city, which also gave the famous car brand in honor of Antoine de la Mothe (1658-1730), born here founder of the car city of Detroit and later Governor of Louisiana, the name. The appellation Cadillac was and is still valid today only for sweet wines. The red wines were under the year 2008 under Premières Côtes de Bordeaux produced. In 2009 it was under the newly created Dachappellation Côtes de Bordeaux a reorientation with partially changed name. Under the new appellation Cadillac - Côtes de Bordeaux , the vineyards cover 3,400 hectares of vineyards on gravel and calcareous soils. These stretch as a narrow band with 5 kilometers wide and 60 kilometers in length on the right bank of the Garonne from Langon to Bordeaux in almost 30 municipalities. The red varieties are Merlot (55%), Cabernet Sauvignon (25%), Cabernet Franc (15%) and Malbec (5%), as well as the white varieties Sémillon (70%), Sauvignon Blanc (17%) and Muscadelle (13%). ). From the white wine varieties are under Premières Côtes de Bordeaux and Cadillac Sweet wines produced. The red wines are now produced under Cadillac - Côtes de Bordeaux . Well-known wineries are Château Birot, Château Carignan, Château Carsin Château Fayau, Château du Grand Mouëys, Château Laurétan, Château Lezongars, Château Plaisance, Château Puy Bardens, Château Reynon and Château Tanesse. This page was last modified at 4 November 2017 at 08:21.